List Desktop Icons In List View To Increase Desktop Area. How List Desktop Icons In List View To Increase Desktop Area. 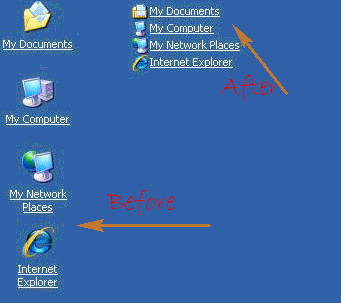 Home >> Freeware >> Portable Apps >> How List Desktop Icons In List View To Increase Desktop Area. I’ve shared Fences by StarDock to reduce the desktop icon clustering, still case you are looking for a simpler way then you can try lists the desktop icons in list view, reducing the size and increasing desktop space for having more icons. 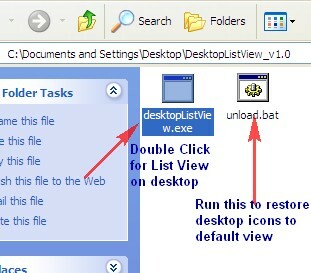 List view is available in folders in Windows but not available for the desktop where all icons and folders are only seen in large sizes.Using Desktop List View application which is a tiny application which lets you lists all desktop icons and folders in list view in a single click. In case you want the list view of your desktop by default the extract the “desktopListView.exe” from the zip file and paste it in “C:\Documents and Settings\All Users\Start Menu\Programs\Startup” folder. I would really love this for windows 7 as well! I found a great little freeware software and am spreading the word. If you have a 64 bit system then Deskview will not work for you but this does… IconRestorer and it just so happens to have a list-view option which still gives you control over the size of the icons on your desktop! Finally! I have been spending days to find something that works for 64 bit systems and all i keep stumbling upon is deskview.